As a child, spiders were the thing of nightmares to me. Maybe it's that primitive instinct that developed when we were cavemen telling me that one bite would spell my doom, or maybe it's just the fact that I don't like 8 small legs crawling on my face, but until a few years ago I was paralyzed by the sight of one. That was until about 2 years ago when I took the time to learn about some of the spider's in Arkansas, and overcome my fears by humanizing them. 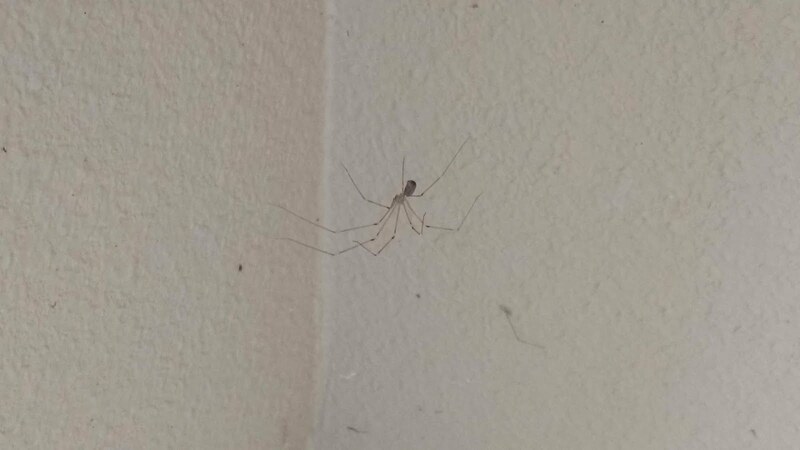 This spider, that is currently living in my garage, is called a Cellar Spider. I've decided to name this one Ochos Locos. This guy may be able to bite, but he can't really hurt you, in fact he should be your best friend. Instead of hurting you, Ochos Locos here hurts things that can hurt you. Cellar Spiders are natural predators to Black Widows, Brown Recluses, and Hobo Spiders. Not only that, but spiders know how to party. When threatened Ochos Locos will start vibrating around his web and become a blur. That's right, with his last breath he plans on dancing (though if they vibrate for too long they will run away). Of course I don't let any spiders set up camp in my room (for fear of one crawling on my face while I sleep, and inadvertently causing me to punch myself in the face), I let them hang around the garage and in some corners around the house to get rid of the aforementioned venomous spiders, as well as other insects and pests I'd rather not have in here. You may be asking yourself, why not just get some bug bombs and kill them all? Well, poison will work for a while, but at some point the spiders are going to come back. 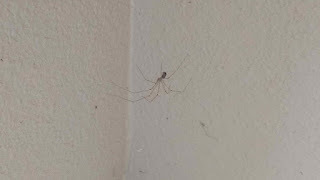 One of the reasons why I don't really see many venomous spiders in my house right now is because of the higher proportion of Cellar Spider to venomous spiders, but after a bug bomb that proportion would be reset. I would see even more venomous spiders because without a predator, they would find it much easier to "live long and prosper". With this in mind I've let my friendly neighborhood Cellar Spiders live unmolested, and whenever I find one in the house, I relocate it outside. If I find a spider that has been doing its job well (killing things I don't want in the house, and not coming into the house) then they I sometimes name them, and that's how Ochos Locos came to be. Hopefully now you'll think a second before you smash the next spider you find, and potentially name it, and if you want to learn more about your newest spider friend, check out the Wikipedia Article!